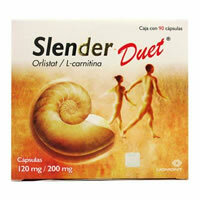 Slender duet with orlistat is a weight loss supplement which blocks to up to 30% of the fat contained in foods. Slender duet is for adult women and men who are overweight or obese and who want to lose weight safely by blocking and removing fat from their bodies. Orlistat blocks the fat that you eat keeping it from being absorbed and converted into fat by your body. Orlistat is recommended to help women and men lose wieght and to help them reduce the risk of regaining weight already lost. Orlistat must be used together with a reduced-calorie diet. Taking L-Carnitine on a daily basis increases the blood and muscular concentrations of this amino acid, enhancing fat metabolization and subsequent faster weight loss in women and men. How Does Slender Duet Work? Slender prevents your body from absorbing 30% of the fat in the foods you eat. It works in your stomach preventing the fat from being absorbed by your body and eliminating it naturally during defecation. How You Should Take Slender Duet? Because the vast majority of foods contain fat, you should take one Slender duet capsule with each meal or up to one hour after each meal. You should not take more than 3 capsules a day. It is advisable to take a multivitamin such as Vivioptal, Pharmaton or Biometrix once a day while taking Slender. Can You Take Slender Duet During Pregnancy and Lactation? It has not been established the safety of using Orlistat during pregnancy therefore it should not be administered. It is not known if Orlistat is excreted in breast milk so their use is not recommended during lactation. Who Can Take Slender Duet? Slender can be taken by men and women 18 and older. Slender duet is for men and women who want to lose weight and want to keep their weight off after having reached their desired weight loss. How Much Weight Can You Lose With Slender Duet? Men and women can lose equal to or greater than 10% of their body weight once completed a treatment ranging from 3 to 6 months. When you take slender duet, you should combine it with a low-fat diet and exercise. Does Slender Duet Have Side Effects? Clinically it hasn't been found any side effects produced by Slender. However treatment effects can occur, mostly limited to the gastrointestinal tract causing by eating excess of fat this way fat is evacuated in liquid form thru the feces. Does Slender Duet Have Any Interactions With Any Medications? Slender duet Does Not interact with alcohol, digoxin, nifedipine, oral contraceptives, phenytoin, pravastatin, statins, warfarin or metformin. Can Diabetic Patients Take Slender Duet? Yes, Slender uet is indicated as additional glycemic control in patients with diabetes mellitus type II, overweight and obese people treated with low-calorie diet control and oral hypoglycemic agents or insulin.